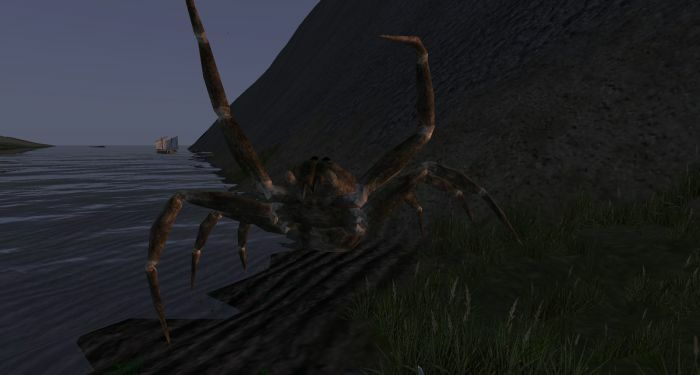 Caught In A Web #WurmOnline – Nomadic Gamers, eh! Wurm Online has been going through a lot of pretty neat changes lately. Due to a hacking incident the forums and web site have been revamped, and the wiki is now back up and running. Everything is smooth on those fronts at least. Kelp, reed, and papyrus sheets were added, along with ink and octopus to make it. Bison, hell hounds, hell horses, and hell scorpion were added, along with inner walls and new graphics for stone houses. One of the latest additions to the unstable client (you must have experimental packs enabled) has been spiders. Now, as a gamer I am pretty oblivious to most types of creatures – but this updated spider graphic is actually causing a lot of stress for some players. Those with arachnophobia, in specific. There have been forum posts made by these players, requesting some other method of enjoying the game that doesn’t involve looking at these incredibly well detailed (with amazing animation might I add) critters. If they can not find a way to play the game without avoiding these creatures, a handful are threatening to quit and leave the game for good. Well. I haven’t really decided. I think it’s a bit much to change graphics based on a few peoples fears. On the other hand, these graphics were not in the game when these players started, and if they were, they probably wouldn’t have started or stuck with the game. Alienating players is never a good thing. Is there an issue with graphics being TOO realistic? Just some of the thoughts in my head. I’m staying out of the debate aside from making it known that there IS a debate, simply because it is something that I can’t really form an opinion on. If you’re not afraid of spiders, I highly suggest you download the unstable client and make sure experimental packs are selected and take a look at them. The way they approach during combat just makes my skin crawl (not a bad thing) and I personally applaud the developers for such fantastic work. Anyway, that phobia can make playing games like Fallout 3 or Fallen Earth very, very tricky since it has some giant roaches mobs. Yet I remember fighting roaches in a old JRPG without problem. I think it was one of the earlier Breath of Fire games. Probably even Fallout Tactics too though I am not sure now if it had giant roaches enemies. So, I would say, yes, it is possible to have something as a too much realism that can trigger phobias. I don’t play Wurm Online but I feel for those who were affected by this change. I hope they can reach a middle term to make everyone happy. NoobRaider’s suggestion seems like a good way to solve it. The spider threads on the forum have been pretty painful to read, with so many thoughtless reactions. People who don’t have real phobia will never understand them. Me, I’m phobic of blood, and it certainly does influence my choice of games and movies. Wow OMG! I happen to be one of those arachnophobe’s and I gotta say that is horrible and if they animate too then *shiver*! I’m not sure how much it would put me off playing though. Atm my fight skill is still very low and I am only able to kill the young and adolescent ones but as I got higher and was able to kill them all they might not be so scary. Though, I think it would be a very simple matter to simply have a checkbox in the options for ‘use old spider models’. Many old games like Everquest have similar toggles for veteran players who prefer the old graphics if for no reason but nostalgia.